This one goes out to you, maxqnz! We are reminded of a scene from Dazed and Confused. The nerds are driving to the party and, on the way, they are discussing their futures. Tony asks Mike, "So, you're not gonna go to law school? What do you wanna do then?" Mike, played by the excellent Adam Goldberg, hesitates a moment and then exclaims melodramatically, "I wanna dance!" That... is the passion of Aag. Except Raj Kapoor's breakthrough film didn't mean it ironically, but rather was earnest in its desire to live, to act, to be! Yes, it's all very passionate, in a very 525,600 minutes way. Already early on, as Raj Kapoor's Kewal entered the matrimonial bedroom and gave an effette flick of the wrist, and we were flashed back to vivid memories of Kenneth Branagh and yet more Kenneth Branagh, it was clear that this would be a movie about acting and passion and writing in italics. 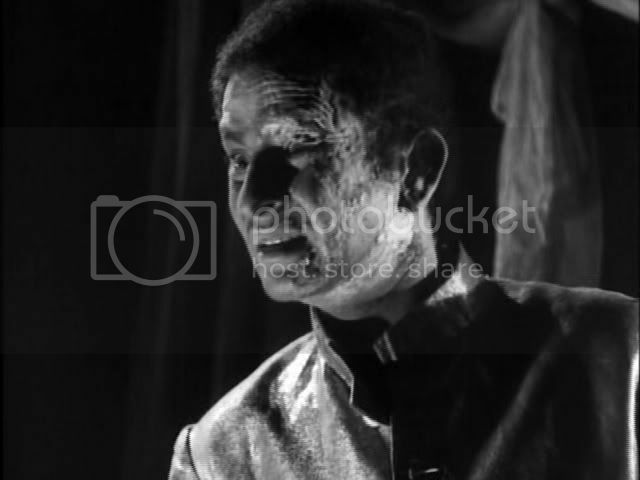 The Quest for Nimmi, Part One: Kewal (Raj Kapoor) enters the matrimonial suite and frightens his nameless bride and us by giving us a scarily-lit view of his hideously scarred face. Alas, alack, he cries, drama queen that he is. Back in the day, he was a handsome man... (Wayne's World sound effects). Mini-Kewal (an outrageously adorable and sassy Shashi Kapoor) honing his technique of looking SHOCKED, I say, SHOCKED. 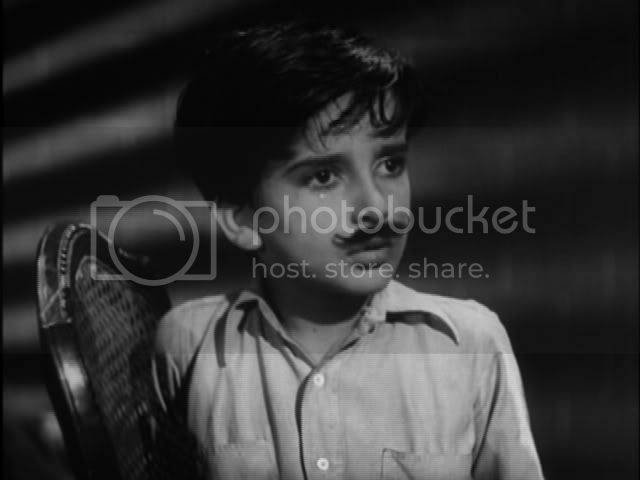 The Original Search for Nimmi: Enter teeny, tiny Shashi Kapoor, playing the young Kewal. Side note: Shashi is so freaking adorable in these scenes. Anyway, mini-Kewal is big friends with little Nimmi, and he is also a theatre freak. After the local theatre troupe comes to town, mini-Kewal decides he too must be a theatre person, and so he dons a moustache and some managerial skills and sets up his own show. But alas, his leading lady, Nimmi, is nowhere to be seen! News arrives: she has moved away! University-age Kewal (a moustacheless Raj Kapoor) is still perfecting that technique. I think we need to throw that head back a bit further for the full SHOCKED effect. The Post-Adolescent Search for Nimmi: Enter university-era Kewal, now moustacheless and strangily lacking his usual Raj Kapoorness. Maybe it was the moustache, after all. Anyway, Kewal still has his head in the clouds, and he still yearns to be free of the shackles of bourgeois normality. One day, a cute girl arrives on campus. Kewal, smitten, asks her to be his Nimmi. She agrees. He stages the play again. She doesn't show up again - this time because she got engaged the day before! Rajan (Prem Nath), the model Successful Bohemian. Yes, it can be done! The Adult Search for Nimmi: Kewal fails uni and decides on a career path as a professional drama queen. His father (Kamal Kapoor, who looks an awful lot like Narang) is appalled, but his mother does the usual Hindi Movie Mom thing and cries and cries and, well, cries. 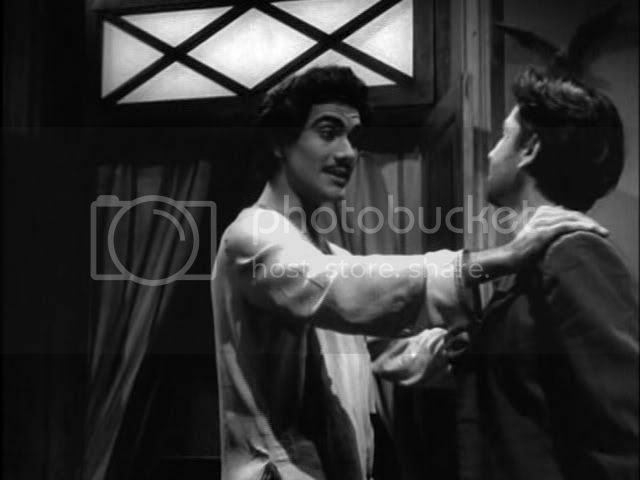 Kewal meets a fellow bohemian artist type, Rajan (Prem Nath). Rajan is a painter with money and a strong jawline. They become friends. They decide to stage a play. But they need a leading lady! 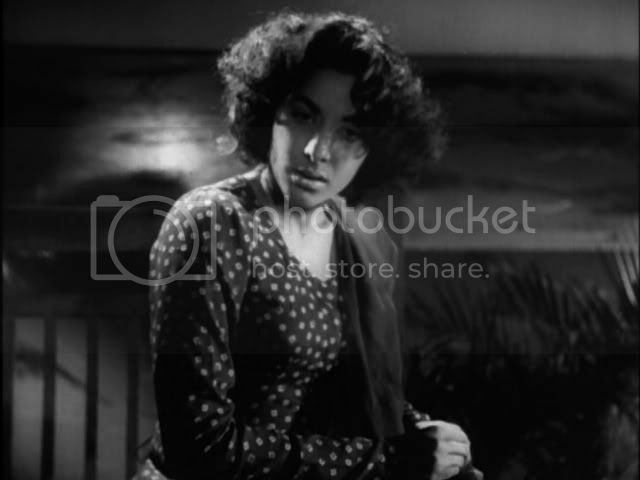 After sifting through every girl in Bombay, a dark, brooding girl (Nargis) with a mysterious past which involves violence in the Panjab appears. Both men are smitten and Kewal, without fail, asks her to be his Nimmi. She agrees. The play is finally staged! But Rajan is so sad he puts a damper on the play's successes, and Kewal is forced to burn his face off, thus alienating Nimmi #3. Nimmi #3's helpful response to seeing the injured Kewal? "Aiiiieeeeeee!!!" The Burn Victim's Search for Nimmi: But will Kewal ever find his Nimmi, especially now that he has been burnt beyond recognition?! The quest continues. This scene was actually incredibly poignant. Raj Kapoor said this film was about youth's Carpe Diem-style ambitions, seeking more from their lives. In that respect, the film certainly succeeds. It still carries the rough edges of silent era cinematography, and so we are loaded down with dramatic lighting and overly theatrical scowls. To the modern viewer, it all seems a bit melodramatic, and while the melodrama fits in well with the character of Kewal, it's difficult to emotionally engage with it. This film is a bit like a rougher, earlier Awaara - it hasn't aged as well as the later film, though it has several similarities (poverty, an adult reunion with the childhood friend and girl-next-door). When the film really works are in the more understated moments of poignancy: for example, the scenes when an exhausted and starving Kewal meets Rajan, and the two kindred spirits immediately strike up a friendship. The interactions between Raj Kapoor and Nargis are electric as ever. Generally, all the scenes of the theatre business chugging along are wonderfully put-together and evocative. It all crumbles into melodramatic mush during the climaxes: when Kewal learns Rajan's feelings for Nimmi3, or when Kewal is burned. 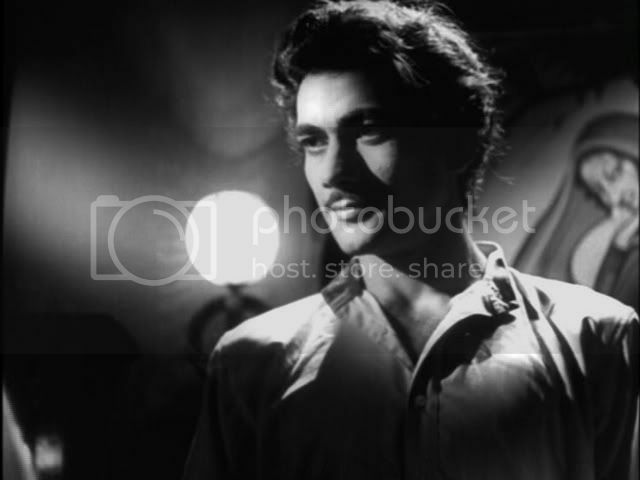 In this respect, we think Awaara is a much better film - because during its climaxes, things never spill out over the top. 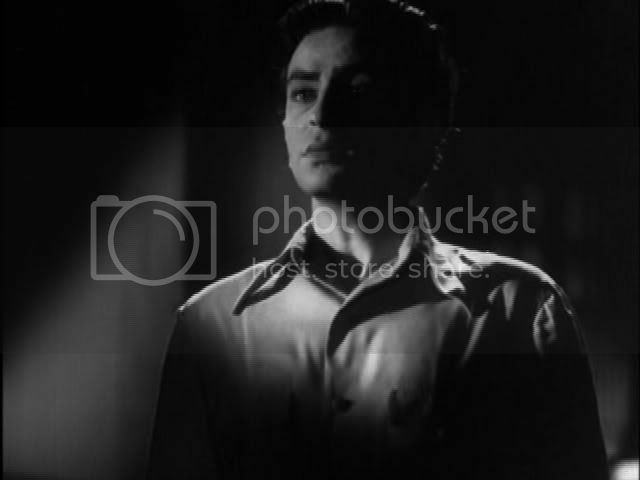 And Raj Kapoor's reaction to the arrival in Nargis is much more beautiful in Awaara. Gush, our favorite scene! Raj Kapoor and Nargis; watch the sparks fly! That said, while the filmmaking has aged, the structure of the narrative is very good. In particular, even if the ending is logically unbelievable, it is still very emotionally and aesthetically satisfying - it just makes sense on a gutsy level. Also, the constant symbol of fire is used well to capture the vibe of a smoldering youth, ready to give sparks and explode. It goes without saying that the music is fab; but then, they always say how Raj Kapoor had an ear for melody. Sunie. This sounds...awful. Even after being heavily indoctrinated to the filmi way of things, I'm not sure I could handle this well. But I am pro proto-Shashi fo sho! Have you seen this? http://www.youtube.com/watch?v=YFFw9XCM_RU Check how he's still got the half-smile head-tilt melty magic! Well, it's hard to watch, in that its age shows so much. I'd definitely recommend Awaara instead. But OMG Shashi is cuter in this one. He's so CUUUTE. And aah! Elderly Shashi! Sigh. He does still have that smiley, tiltey flirty quality. I think I read on Shammi's site somewhere that his brother had the ability to "charm the pants off of anything remotely female". Sigh, that's our Shashi dear! If I didn't already think smoking was gross, I'm sure I'd stop. And I'm having a conversation with someone on facebook about whether that's Shashi doing the ruler smacking. What say you? How did I miss this review? I wrote about this film as my first post on my blog and was less kind than you are to it. Dreadful movie, all that angst and self-pity. But Shashi....my god. So cute! Please excuse the tardy reply, but My Aag-loving radar has only just sniffed out Beth's reaction, and any negative comments about one of my all-time favourite films must be addressed. this wonderful film. A friend whose opinion I value suggested viewing this as part of a diptych with Satyam Shivam Sundaram, to compare them and note the way that Kapoor's approach to a similar theme shifted from the very beginning of his career to the latter end. I think it could be said say that while the leitmotif is nearly identical, the handling and tone are very different. Of the two, I would say that Aag is the more upbeat (as in the bright, breezy and somewhat cheeky "solah baras ki") while SSS is the work of a older, more experienced and thus more cynical and disillusioned auteur. I think this fits with your mention of RK's comment that "this film was about youth's Carpe Diem-style ambitions, seeking more from their lives". I absolutely adore this film and find the cinematography reminds me quite a bit of Vincent Ward, especially The Navigator:A Mediaeval Odyssey"